Snowpack: HS >270cm, PF 75cm, PS 35cm. Snow appeared lightly wind-effected in open areas and treed terrain alike. 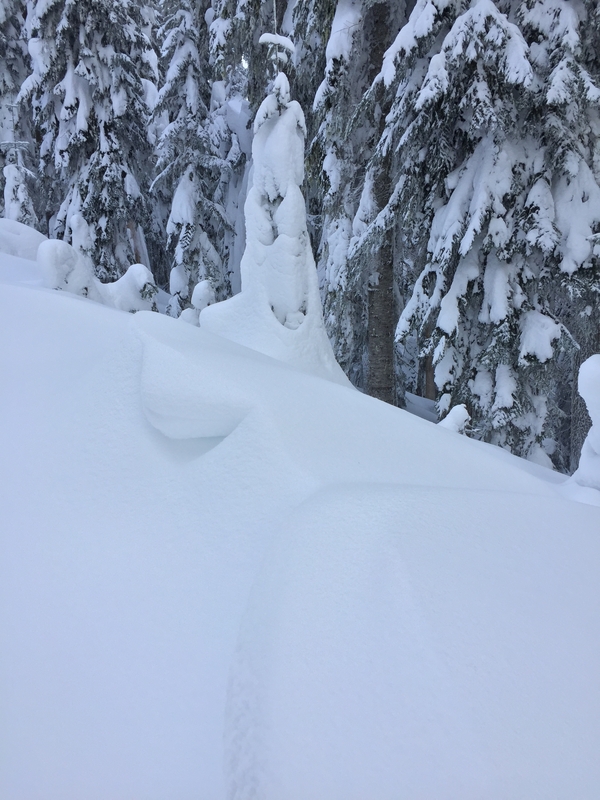 At ridgetop there were small cornices that were built from W winds that were not there on Monday. Also despite seeing large surface hoar everywhere in the same area on Monday, I did not investigate whether it was still present beneath the new snow. HST was difficult to gauge in open areas as it appeared to blend seamlessly with the snow from the last storm, but in treed areas was around 60cm on top of tree bomb crusts. Avalanches: Loose wets aplenty after 10am on steep sunny slopes beneath trees/rocks. No slab avalanches observed.